Last month, WITI kicked off an alliance that provides its members with a free executive membership in the Human Capital Institute. Normally $199 per year, this partnership offers WITI members unlimited access to HCI thought leadership, cutting-edge research and education. HCI is an exciting clearinghouse for innovative new strategies that help organizations hire the best people, develop their potential and nurture innovation. Why is this important? Because leaders realize that success today increasingly relies on individual creative talent and team execution. 2004 is coming to a close; do you need help figuring out "what next?" Do you want to explore what your life purpose is, so that you can create a "Mission Statement" for your life? Please join us for a WITITalk Teleclass. Participants in this teleclass have made major changes in their life, after just the first class!! What is it that you are doing in you life right now that you would like to stop doing? What is it that you are not doing in your life that you would like to be doing? What is it that you don't have in your life right now that you would like to have? What is stopping you, or getting in the way of your doing or having these things? 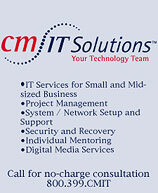 CM IT Solutions provides outsourced IT support for small businesses. We maximize profitability by helping small businesses efficiently use the technology that they already have. Our trainers and technicians are fully trained and certified and will go to your place to work one-on-one with you on your own computer. We also help small businesses with their technology purchases by providing shopping services, and we install and maintain networks and equipment. Computer Moms is a nation-wide franchise that is headquartered in Austin, TX, and has operations in 26 states. Don't miss this unique opportunity to develop, share, and reinforce new leadership skills and competencies, expand your sphere of influence (power base) through peer networking, and extend your access to knowledge and perceived priority - through affliation. The Women's Leadership Breakfast is coming to New York City on September 22, 2004. WITI Members: Visit the Members' Discount Page for the promo code to receive the partner discount rate of $75. Register today online or by phone (212-937-8413). The 8th Annual "NAWBO-University: Ready * Set * Grow!" is scheduled for Thursday, September 23, 2004 at the Wilshire Grand Hotel. NAWBO University will focus on enabling small business owners to recognize opportunities and effectively manage resources to stimulate business growth. WITI Members, check out the Discounts page in the Members' Area for the promo code to receive a $25 discount off the individual ticket price when you register to attend the conference. You can register online at http://www.nawbola.org/events/info.php?id=1495. This one day event includes Case Studies, Best Practices, Latest Trends, Stats & Facts, Interactive Sessions & more. Coming to Boston, MA, on Octover 14, 2004. WITI Members: Get $200 off the regular rate! Please visit the Members' Discount Page for the promo code. Register today at www.mobilemarketingroadshow.com or call 212-330-8381. Paladin International and Business and Technology Insider Radio are bringing you an entire format to prepare you to talk directly with federal agencies about specific opportunities. Dont walk away scratching your head about where to go next...come to "Marketing to the Federal Government" at the Sheraton Premiere in Vienna, VA on Nov 2-4, 2004, and be ready to talk real contracts! Confirmed participants include DHS, ARMY, Commerce, NASA, HHS, DOJ, DSS, OPIC, GSA Advantage and more! We have the Contracting Officers from some of the major agencies presenting contract opportunities. Accomplish more with us in 3 days than you can on your own in a month or more! For more information, visit www.technologyinsider.net/mfg04/. Some of the most profound scientific advances of the 20th century took place at Los Alamos National Laboratory (LANL). Moving forward in this new century, the world-class research environment is designed for unlimited professional and personal growth. Scientific expertise is both broad and deep and ranges from innovative biological research to modeling global climate, and from novel methods for examining material properties to helping explore the outer reaches of the solar system. Search for Los Alamos National Laboratory jobs on WITI4Hire. Lexmark International, a Fortune 500 company, seeks a Hardware Engineer for its Lexington, Kentucky location. This is a Firmware Development Engineering position for embedded software development for printers and AIOs. The successful candidate should have experience and education relating to embedded software development for real time systems. A knowledge or electronic hardware and software development processes is desired. Also, the candidate should posses excellent communication and teamwork skills. Programming skills in C/C++ in an embedded environment is required. Candidate should posses a minimum of a bachelor's degree in CE, EE or CS and at least two years experience.